Imagine you want to explain something to someone. Something that might be hard to transfer. Like an idea or concept. Something that is very extensive and diffucult to capture in a few words. You might consider making a whiteboard animation. A tool that is excellent to share thoughts and knowledge. Because it allows you tell a story. The visual images support the story and make your message easier to process. And the short duration of the animation forces you to get to the core of what you want to tell. A whiteboard animation might seem simple to make, but there is a lot more to it than you think. This is the second part of a two-piece blog post on how to make a professional whiteboard animation. Again, we’ll explain how we did it; the way it worked for us. And hopefully we can provide you with the tools you need to make your own perfect whiteboard animation. In this part we’ll cover the story side of a whiteboard animation. We’ll explain what you need to know before you start, how to craft a storyboard and how to design the animation. We’ll tell you how to make a story for a whiteboard animation that works! Maybe it sounds obvious. But this first step is skipped by many. In this step we want to remind you of the importance of understanding your audience and defining a goal and make sure you keep it in mind while you work on your animation. You can’t make the right whiteboard animation without knowing who you’re making it for. It is important because you want to set the right tone. You want to use examples that your audience can relate to. And use the language they understand. Think about where you are going to show your animation. Is it going to be online for a blog diverse audience, in a conference room with experts on a specific topic, in an auditorium filled with students? Try to know as specifically as possible who you want to reach. After that it is important to spend some time in getting to know them. What drives your audience? What is their perception of the world? Make a print and put it on display every time you work on the animation. Maybe you can pin it on a wall somewhere. This will help you keep focus on who you’re making the animation for throughout the whole process. 2 WHAT IS YOUR GOAL? Do you want to inspire people? Persuade? Explain something? Inform them? It might feel as if you want to do all of those things, but in order to have a clear message for your audience it is best to choose one main goal. Think about your motivation for making the whiteboard animation and define a clear goal. (Example: I want to inform my audience on how to make a story for a whiteboard animation that works.) Write it down, make a print and put it next to the print from step 1. You can’t work without a good storyboard. In this step we’ll explain how to get the ideas in your mind to a functional storyboard you can work with. Ok, so now you know who your audience is and what drives them. Let’s think about what you want to tell them. There are probably a lot of things in your mind that you would like to put in your whiteboard animation. Maybe they are unorganized thoughts, maybe you already have a clear picture of what you want to say. Either way, get it all out on paper. Don’t mind logic or order. Just keep it coming. Grab a stack of post-its. Write everything that comes to mind. Don’t mind logic or order. Just keep it coming. Stick them onto a wall or place them spread out in front of you. With all the information out on the table we want to create some order. Which items are linked to each other? Do some of them overlap or look similar to other items? 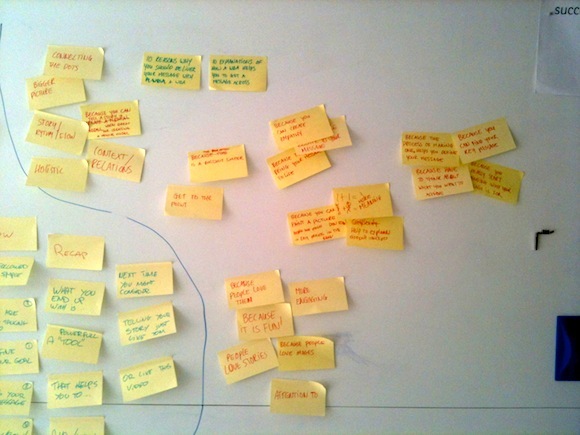 Take the post-its from step 3 and group the items that belong together. After that, find meaningful names for the different groups. Use post-its with another size or color to write the names of the groups on them. Ok, from the previous step there should be a few main topics that you can name. When I would make an animation about this blog post, step 1 till 11 would be my main topics. See these topics as the chapters of your animation. Some topics might be more important than others. See which topics relate to each other and try to find some sort of hierarchy. This will help you to identify the key element of your story, the most important message you want your audience to get. Decide what the more important topics are and which ones are less important. Look at which topics relate to each other. Look at all the different groups and Identify the most important element of your story. What is the ‘it’ you want them to get. Write this down and keep it in sight. The next step is to determine the order in which you want to tell your story. Think in scenes. Create chapters. Play around with the order. Build a storyline with a clear beginning, highlight and ending. This doesn’t have to be the definite order of the storyline. It’s just to create a basis from which you can build your story. Take the groups and topics from step 4 and 5. Move the order of the groups of post-its around. Decide where you want to start and how you want to end. Play around with the order to see what works best. Now you can actually start writing and drawing. You don’t have to be a professional illustrator to make a functional storyboard. Simple images can already help you to get a feel for what the animation will eventually become. Make a template with a place to write and a place to draw. Copy or print it many times. Make sure you have plenty. The words are going to be your voice-over, the drawings will be the animation. Use the storyline from step 6 and translate the topics into chapters. Whit-in the chapters you create scenes.Read your storyboard out loud while you work. It gives you a better feel of what the animation is going to be like. When your storyboard is ready, make a video by filming frame by frame and reading the text out loud. Watch it back and show it to others for feedback. Ask them what they get from your story. 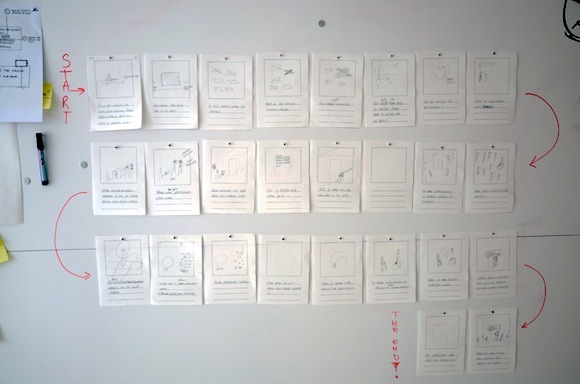 Use the feedback to improve your storyboard. Do this as many times as necessary, until you’re happy with the result. It is not just important that the animation contains all the elements you want to say. It is also important that it is fun to watch and easy to process. You need to create a flow for your audience. In this step we’ll tell you how to do this. Write and rewrite lines. Make them short, fun and easy to listen to. Avoid abstract terms and don’t try to form explanatory sentences that consist of suitable words that appear to mean quite a lot, but are in reality just hard to process. Create rhythm by varying short sentences with longer ones. If the topic allows it, you might consider adding some humor, making people laugh creates sympathy and helps them to open up to your story. Write down the textual part of your storyboard and make a print. Stand up and walk around while you read your story out loud. Walking around will help you feel the rhythm of the story. Some parts might be more difficult to read. This may mean your sentences are too long or your words are too abstract. Break up sentences. Add, remove or replace words. Try to feel the flow of your story. With your textual part ready you can start to create your images. It’s important that the audience understands the images and immediately knows what you are saying. This means your images have to complement your words and vise versa. This makes your message easier to process in the brain. If you want to know more about how you can use images the best, checkout Dan Roam’s “Back of the Napkin”. Go through your storyboard again and see where you can improve images or sentences to make them more complementary. Show your improved story to others and ask them how they interpret your different scenes and story as a whole. 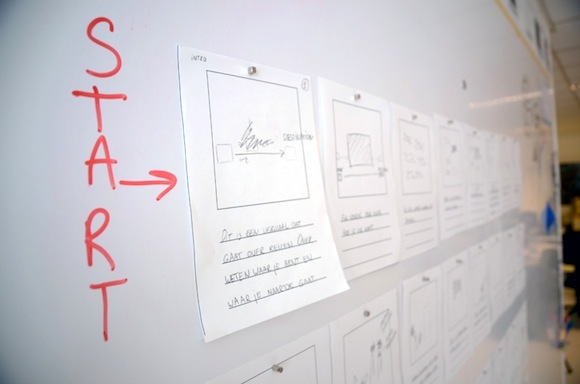 Use their feedback to improve your storyboard again. Work out your images, make cool transitions between scenes, add color to similar objects. In whiteboard animations it works really well to use black as the basic color and then one or two other colors to emphasize certain objects. The most important object in a scene for example. Check here how well this works. Work on the rhythm of the animation. Speed up if things get exciting, crazy or enthusiastic. And slow down if you want people to think about everything that’s just been said. Refresh your storyboard. Print new storyboard templates and make new version of your storyboard. While you do this, think about the order in which you’re going to draw the animation. Make notes of this on your storyboard. Add color to things you want to stand out. When you feel your storyboard is ready. Rehearse a few times. You’ll find out that some things might not work as planned. Some scenes might take too much time to draw (even after edit) and need to be simplified. Decide the order in which you draw a scene. What do you want to show first and what do you want to reveal later. Take your script, grab a whiteboard marker, turn on the camera and start drawing. Rehearse until you feel you nailed it! 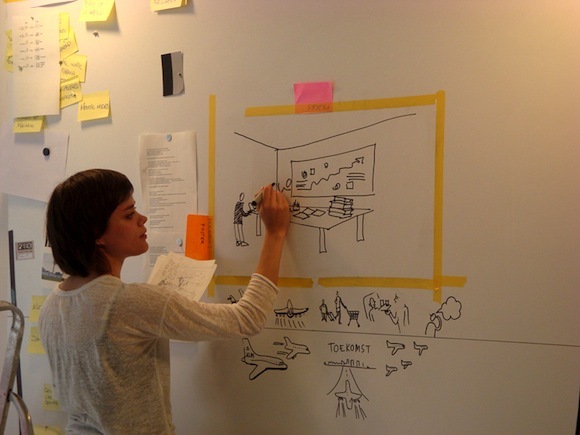 This is a really useful article on creating whiteboard drawing. Its creative, consise, practical, and stated nicely. Thank-You. Can you discuss artist staying out of the camera, or difficulties in drawing off to the side? Was a chair or stool used, were you usually working slightly above and to the right? How did you plan any pans or zooms? My name is Ally Gilbert. I am an aspiring graphic facilitator who is looking to get started. Your step-by-step guide is quite helpful! I never realised how much truly goes into making a whiteboard video. Thank you so much for sharing this information. And thank you also for your time.